Thank you to Valley Isle Excursions for providing me with a complimentary seat on their tour. All opinions are my own. Before I get into my day-by-day trip report, I want to make sure I recognize my awesome travel partners who helped make our trip to Hawaii so memorable. 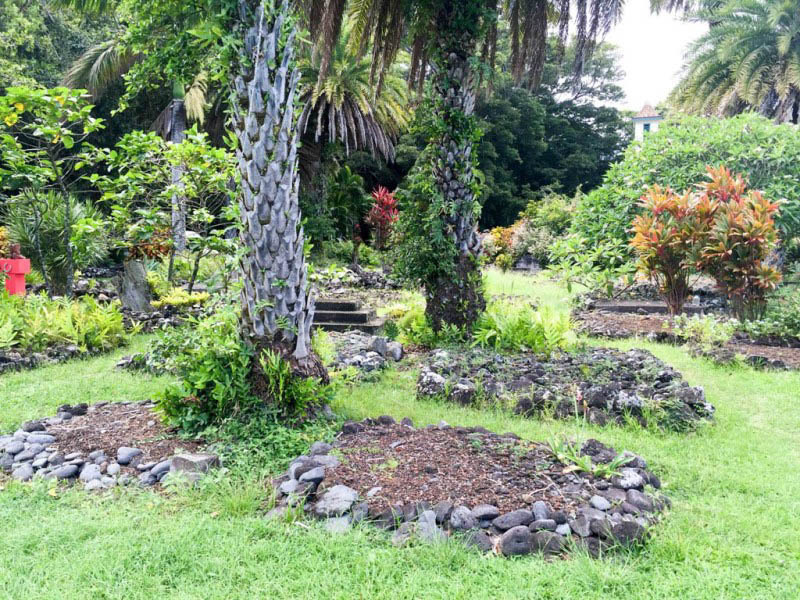 When we were planning our two days on Maui, we knew one day had to be dedicated to the Road to Hana. Maui and the Road to Hana are pretty much synonymous. 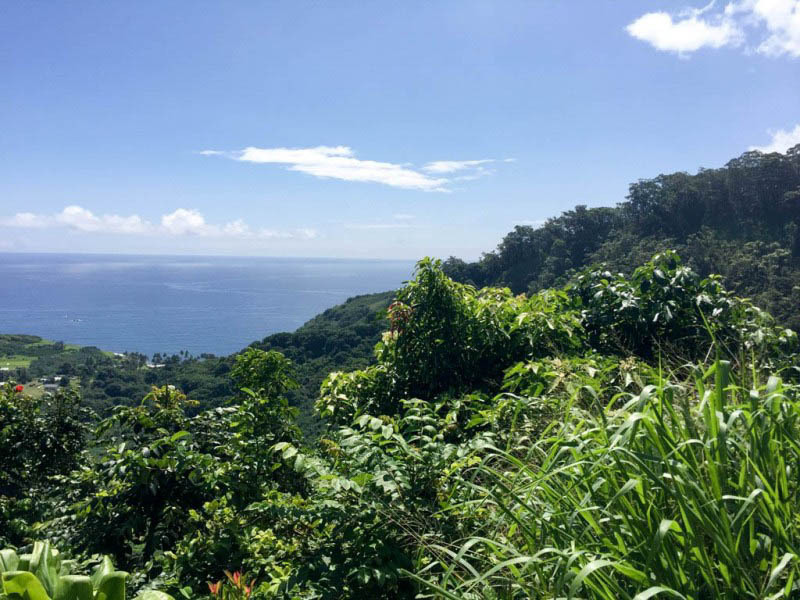 The Road to Hana is also very famously difficult to drive, with lots of steep climbs, blind curves, and one-way stretches of road. A lot of people opt to rent a car and drive the Road to Hana themselves, but the thought of this not only made me nervous, but it bummed me out that one of us would always have to be watching the road instead of being able to admire the beautiful scenery. 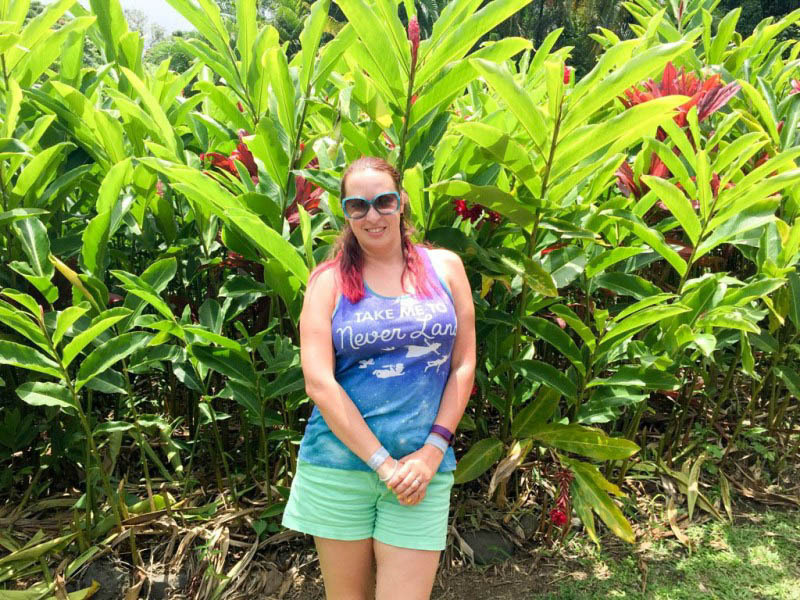 So we set out to find a tour where both Tim and I could enjoy the Road to Hana without the stress of driving on an unfamiliar stretch of road. When I found reviews for Valley Isle Excursions, I knew I had found the perfect tour for us. 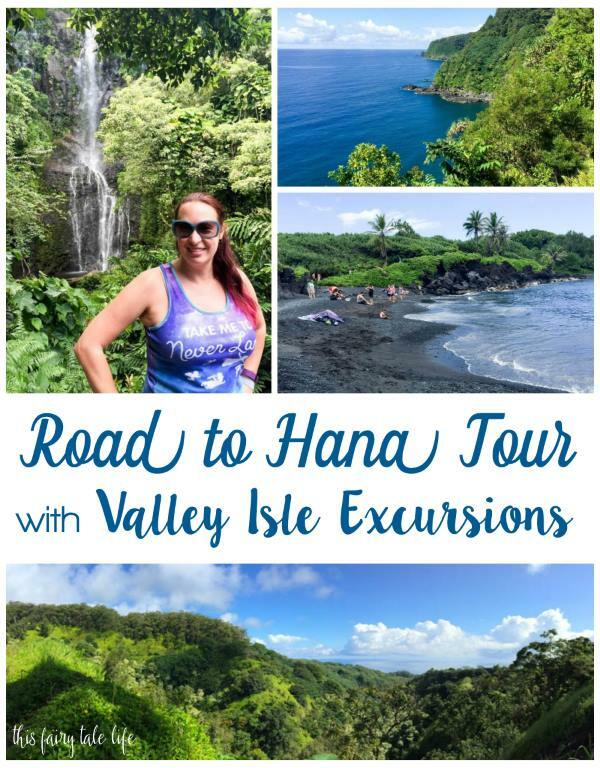 There are lots of organized tours for the Road to Hana, but the reason I liked Valley Isle Excursions is because of their small vans. Their vans take only up to 12 guests per van, which gives you a more personalized experience. By the end of the tour, everyone on our van felt like old friends. We were all chatting and laughing, sharing food and offering to take photos for each other. Another bonus of the small vans is when you stop and get out for pictures. The less people on the van, the less time you spend waiting for people to get on and off. Finally, I noticed on their website their vans have HUGE windows, which is really important on a tour like this. Our cruise ship docked in Kahului, Maui at 8:00am and our meeting time was at 8:05am. They were right outside the port with an easy-to-read sign. A Valley Isle representative directed us to our assigned van. We were introduced to our driver, Uncle Joe. Throughout the day, Uncle Joe was friendly, knowledgeable, and entertaining. We learned Uncle Joe was born and raised in Hawaii and did the Road to Hana tour five days a week! We were so impressed with his knowledge of the flora and fauna of Maui. He knew every plant, tree, and flower. We loved the stories and jokes he told. He also made a point to learn all of our names. I can’t say enough nice things about Uncle Joe! It was a pleasure to be on his tour. Tour Tip – Sit on the left side of the van, if you can. You will get all the nice views of the ocean. We sat on the right side and had front-row seats for some of the waterfalls, and that was nice, too. But if you want the ocean views, get to the van early so you have your pick of the seats. 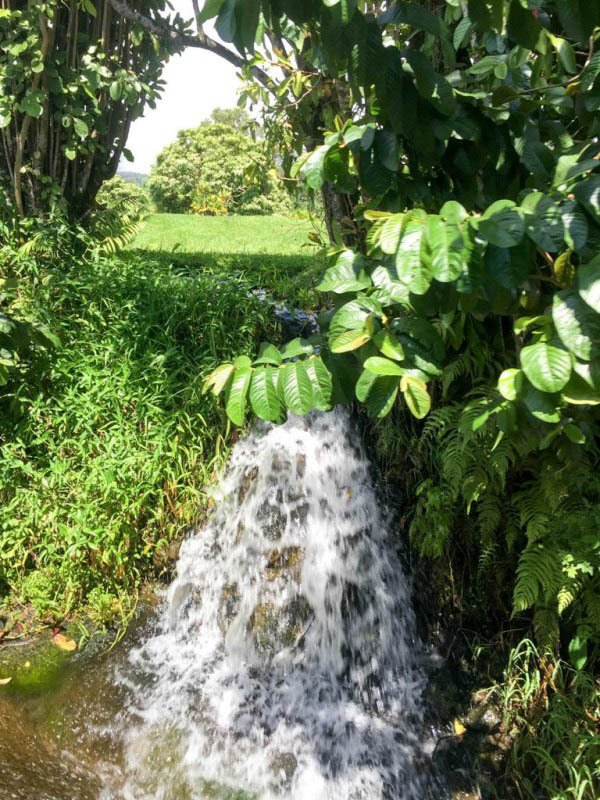 The Road to Hana tour is a long one, 9-10 hours, but there is so much to see it really flies by. Because the tour is so long, I can’t even begin to post pictures of all the beautiful things we saw, so I’ll just list the highlights for me. 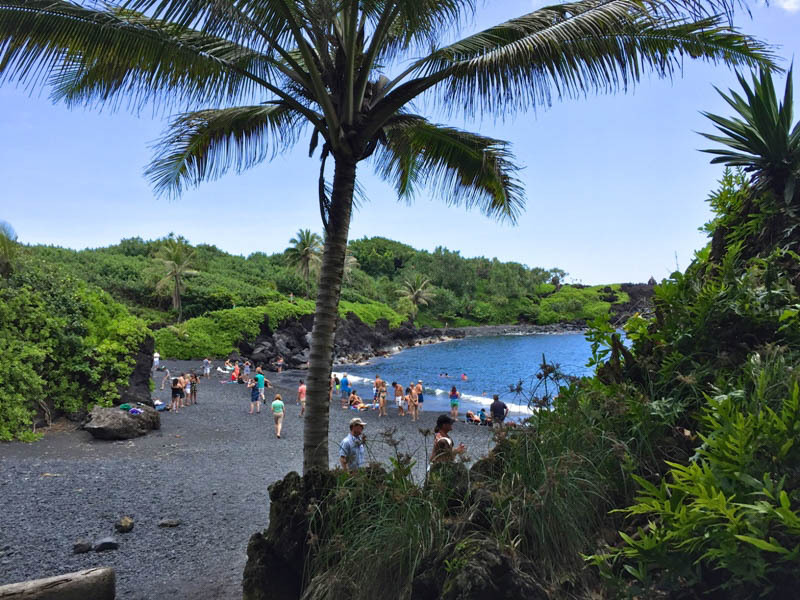 Wai-anapanana State Park – This is where we stopped and saw a black sand beach! We could only stop here for about 20 minutes but it was enough time to put my toes in the sand. 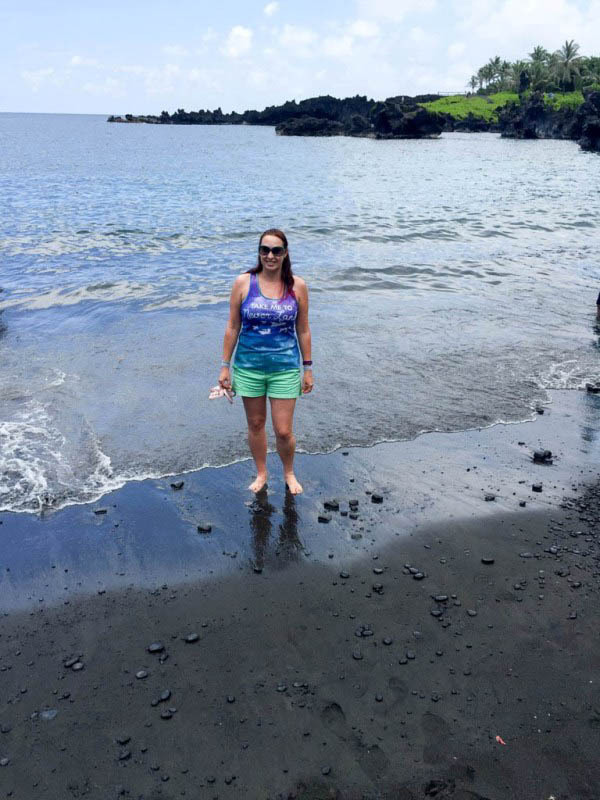 It was on my Life List to see a black sand beach in Hawaii so this was a big thrill for me! 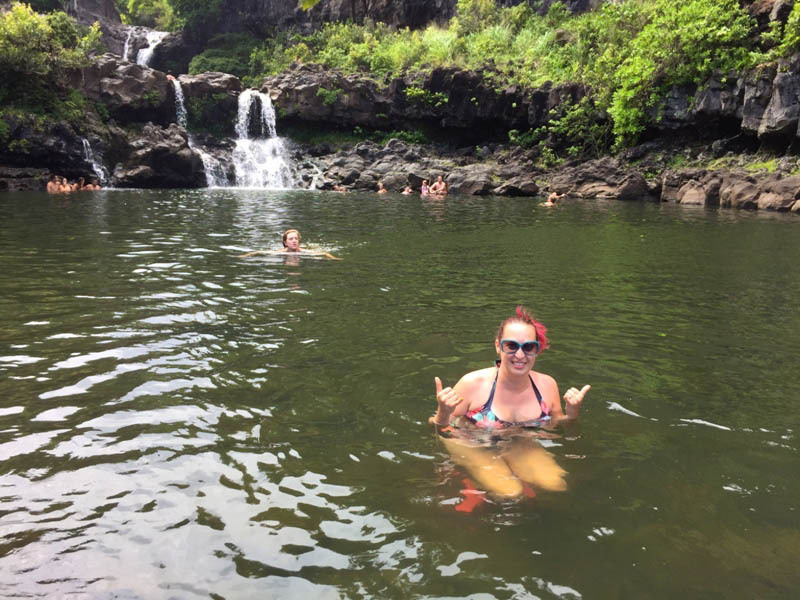 Haleakala National Park – Location of the beautiful Oheo Gulch pools where I got to swim out to a waterfall! Another “Hawaii” moment. Palapala Church – A lovely secluded church that dates back to 1864. This spot was memorable for me because of its beautiful and unique cemetery. I know it sounds weird but I’m obsessed with cemeteries – the older, the better. I try to visit a cemetery every time I travel somewhere new, because you can tell a lot about the culture and the people through their burial rituals. The cemetery here is very small, but notable for being the burial place of Charles Lindbergh. With Uncle Joe’s guidance, we also fed the neighboring wild horses some of our leftover lettuce from lunch. 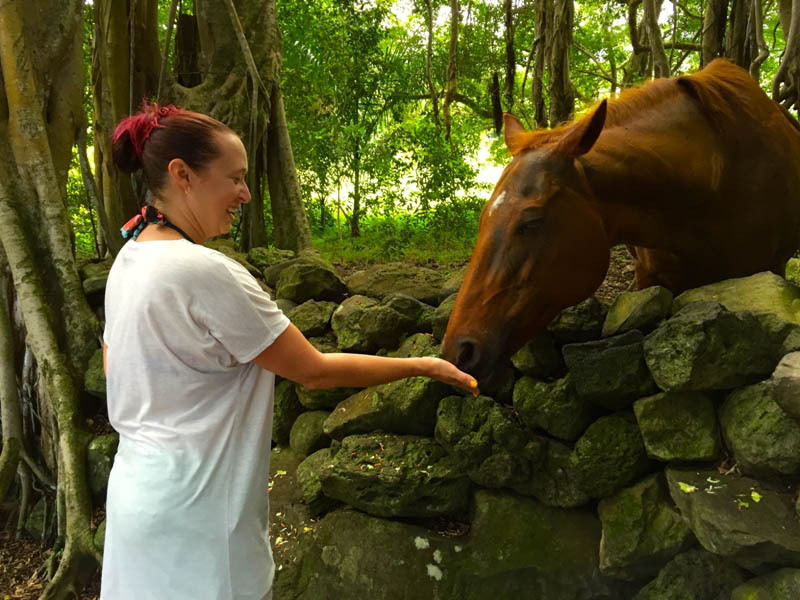 It was my first time feeding a horse and it was strange but fun! 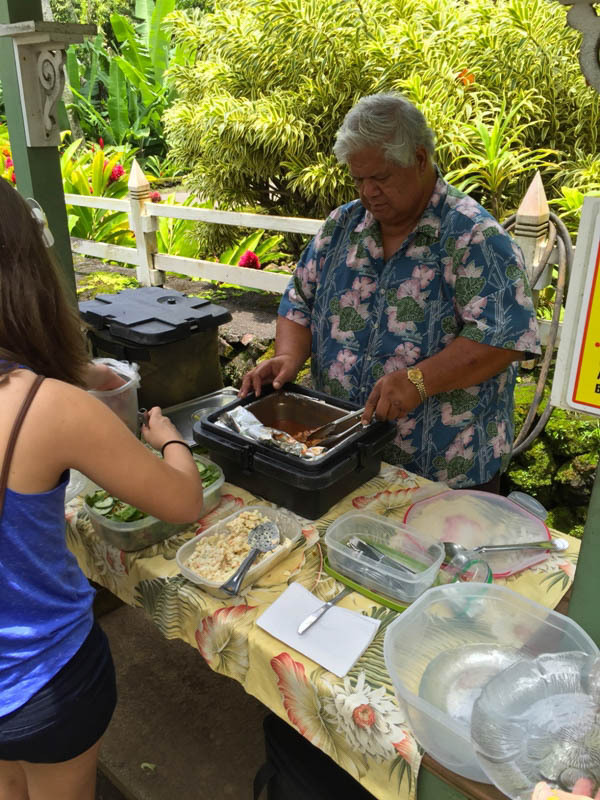 Speaking of lunch, halfway through the day we stopped at a flower farm called Tropical Flowers & Bouquets of Hawaii for a picnic lunch. They had lots of tables and chairs set up to accommodate all of the Valley Isle vans. Uncle Joe served us BBQ chicken, salad, macaroni salad, and rolls. There was plenty to eat. After lunch we had a chance to stroll through the lovely grounds of the botanical garden. Plenty of cold soda and water was available all day on the bus, too. Throughout the day we stopped at a couple other food stands. You won’t go hungry on this tour! Tim and I had such a fun and relaxing day on our Road to Hana tour. 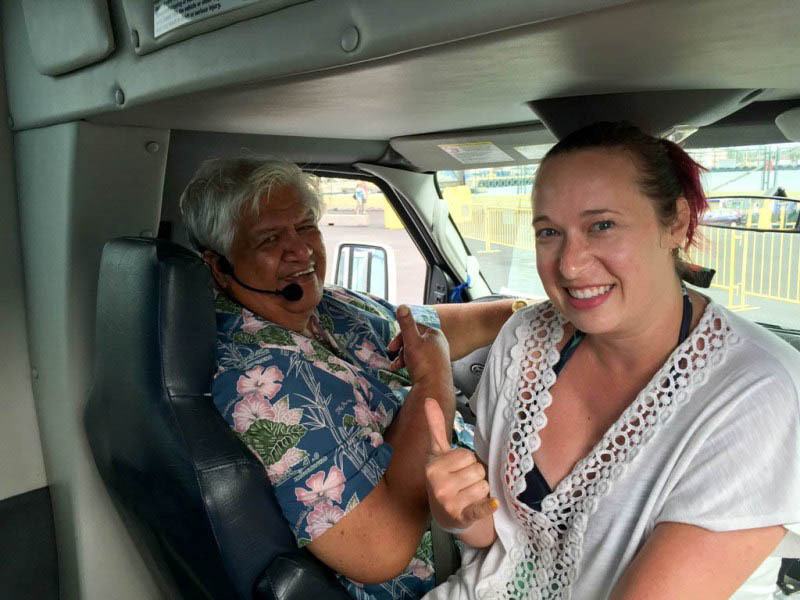 Thank you so much to Valley Isle Excursions and Uncle Joe for showing us the beautiful island of Maui! Have you ever traveled the Road to Hana? What was your favorite spot?